Pets are a hugely popular crafting topic and paired with the new Pawsome Prints paper pad from our new papercraft brand, Paper Addicts, we couldn’t think of a more purr-fect selection of makes for you to try! 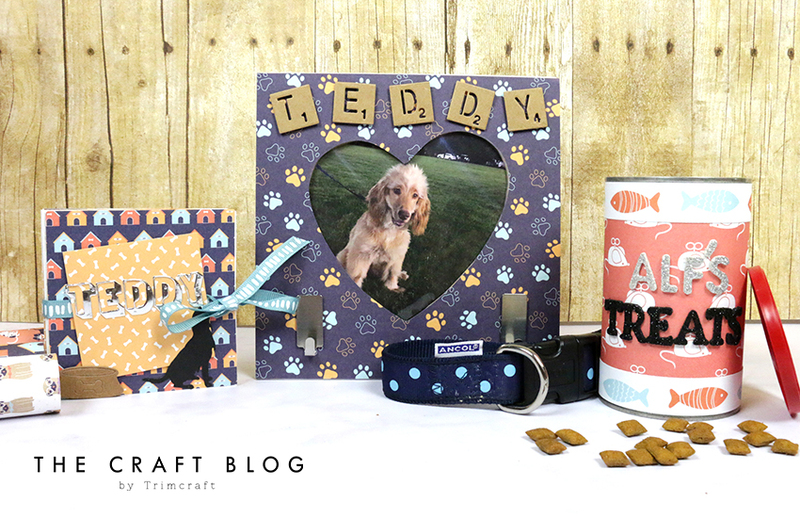 Today, we’re showing you how to create three amazing pet crafts using these fun papers – from a pet accessories holder, to an adorable mini scrapbook. Firstly, we’re going to look at upcycling an old photo frame to create this adorable little accessories holder for your pooch. 1. Take an old, unused photo frame, ready to upcycle. We chose this one with a cute heart shape in the centre. 2. Cover the front of your frame with your choice of Pawsome Prints paper, making sure that you cut around the area where your photograph will be. 3. Using the First Edition Alphabet Tile dies, die cut letters to spell out your pet’s name. Adhere these to the top of the frame. 4. Print out a photograph of your pet to size, so that it fits your frame. Ensure that you’ve got the photograph lined up within the aperture. 5. Add the adhesive hooks to the bottom of your frame. 6. Take a length of Dovecraft ribbon and adhere it to the back of your frame, if it doesn’t have a hook already attached. Use hot glue gun to make sure that it holds well. 7. Your make is now complete and it’s ready to hang your pet’s accessories from! It’s the perfect place to hold a collar, lead, or toys to help keep them safe. We also used these papers to create an adorable mini scrapbook – the perfect place to keep lots of cute photos of your pet. Just look how well the papers all work together! If you’re looking for somewhere to stash your pet’s treats, why not upcycle an old tin with these papers? Ideal for keeping unsightly wrappers out of the way, we’ve also customised ours using Simply Creative alphabet stickers! Will you be getting your hands on the adorable Pawsome Prints paper pad? Please let us know if you do, or try any of these crafts – we’d love to see! Don’t forget to upload your makes to the Inspiration area, or to #Trimcraft when uploading to social media.